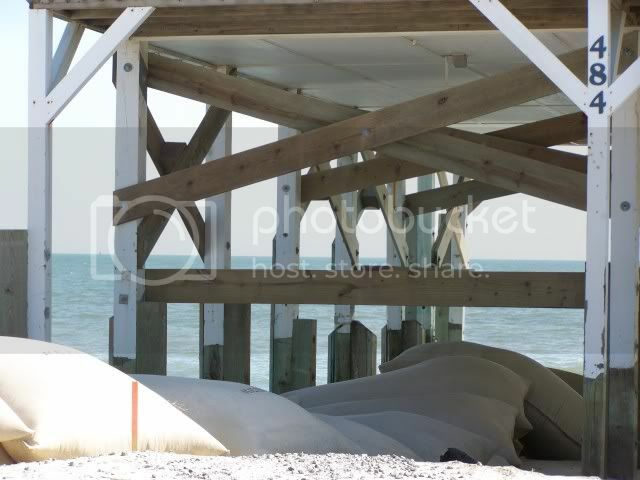 Everytime we visit the beautiful beaches of Ocean Isle, NC we fall in love with the peacefullness and the beauty. However, each time it is being claimed up by the glorious sea. I've visited after storms when streets were gone. Homes were no longer in place.......many falling slowly where they stood. One time, one home was standing out in the ocean......far out...... holding its own like Custer last stand. Today was different because some additional damage was evident. Homes in a row, like a front line of an army brigade....trying to win the battle, that the sea had already won. Here is what I saw today. This damage is also making local news as a bill is in place to restore a barrier. A barrier that would perhaps save the island, and save its residents homes. I hope that it will be approved. Not that I don't understand that more homes should probably not be built in that eastern area. But, just to preserve what is there, and the beauty of it all. Notice the last home in line...standing quite into the ocean. 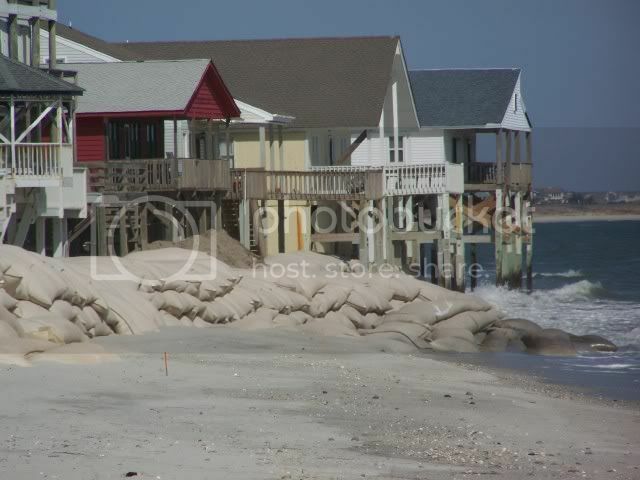 Many more sand bags then I've seen holding back the ocean...although many streets are no longer there on Ocean Isle. As you can see.......some homes are indeed in the oceans grasp already. I hope that NC works hard to get the bill passed that will help this enchanting place. I don't know all the facts on how close this bill is to passing. I only know that my eyes see the hard work that has already saved some. I watched one year as a man, on a cold day, was filling and placing those sand bags. Its nice to see some have been saviors......Its also sad to see, some have failed. Bless your hearts dear people of Ocean Isle......I'm always praying for you. think that these homes should be demolished and removed. should never have been given a building permit. you take the risk , you pay , not the taxpayers. the edge of the ocean. imagine how peaceful and serene, not to mention friendly towards the animals who live by the ocean , if all there was only dunes and nature. should be mandatory to build way inland from the ocean.IMO. I agree there should be no more "close to the ocean" building. I actually like how Sunset Beach, NC left a huge area with dunes and sea grasses. Whether that occured after many a storm took homes away also....I personally don't know. ( thinking it is the case though) They made a park area...and have lots of sea grass before the homes that lead to the ocean. 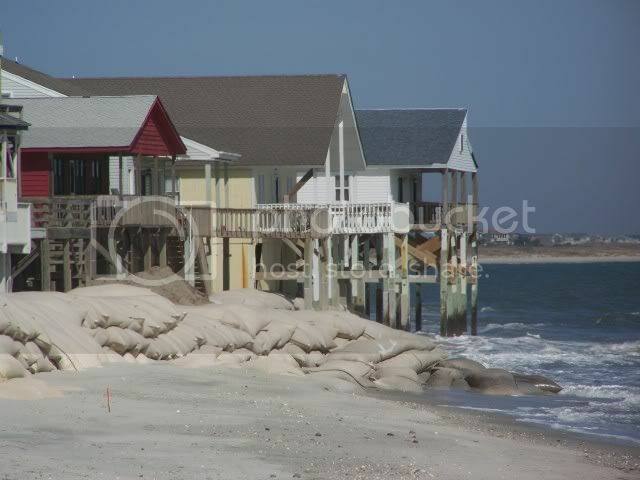 I think with most of the ocean land being washed away that many of these homes in Ocean Isle were not ocean front initially. But even as a taxpayer I'd want the Isle to be shored up. With a "no more building" ordinance within hundreds of feet. Look at Sea Bright NJ........That is the worst example of holding an ocean back. A huge concrete wall going sky high. Below..........the little homes. I'd be deathly afraid to live there. Below the ocean level, good gosh. Maybe its too late for some of these homes with the ocean lapping at them.......So if they are beyond help. Plan on park areas......vacant areas.......give distance to the mighty sea. I have such saddness for some of the home owners. Each year I return and breathe a sigh of relief that a home like the "Big---rs"( I don't want to post their full name) is still standing. My words are always " TG the Bigs are still there." I think North Carolina should stick with it's no barriers rule. They don't work. 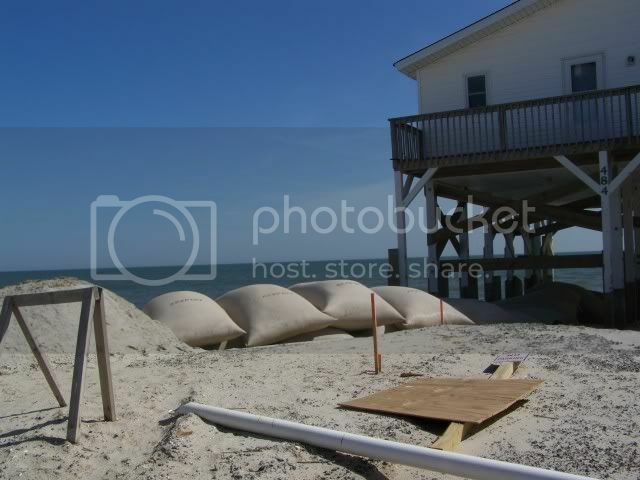 Seawalls or groins in one place cause erosion someplace else. 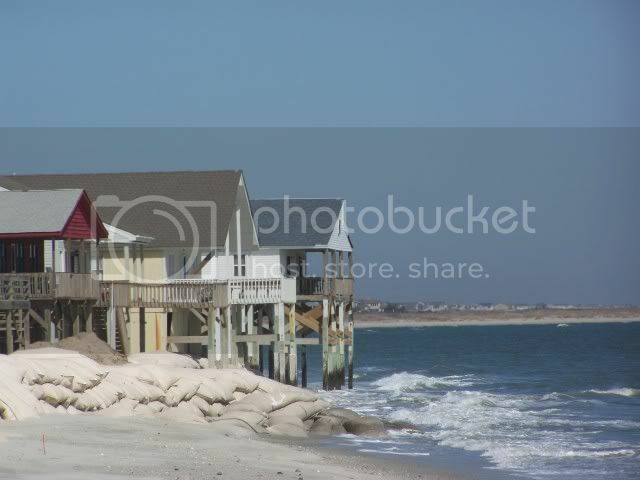 Those homes in your photos are a victim of the nearby inlet that is moving south, not typical beach erosion. Barriers do work. Wrightsville Beach has a rock jetty protecting the inlet and no homes are falling in the ocean, no wildlife has been harmed and it's maintenance free costing tax payers no money. Good luck getting one at Ocean Isle Beach though. The tree huggers will swear it'll kill fish, turtles, birds and other wildlife along with general worldwide disaster. That is interesting to know TimeTravel.... I have followed the destruction for quite a few years now. Just recently ( actually the day I posted those pictures) there was another article in the newspaper about this problem. Looks like your so right, two sides fighting each other. It seems the start, I might have read somewhere, was in 1985. A lot more has been lost since then. Streets and homes, gone. Why is it that Sunset beach seems to have it right. As far as a good barrier before the first row of homes? I really believe...you start where your at now. 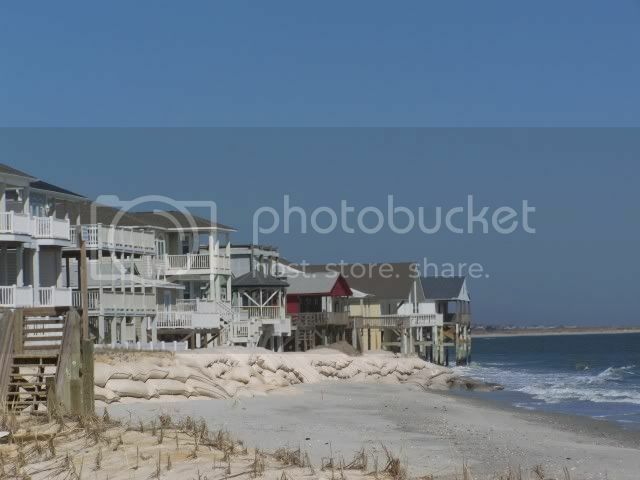 So....Ocean Isle....shore it up, barrier it up and save what you have. The fish, and birds, and turtles will find a home. I love them too! The time is now. Time is wasting.....Soon Ocean Isle will be just a strip of land not worth saving. I'm sorry to say, as I love the area....I really do. Actually these houses were NOT built on the dunes--there used to be a road in front of them. What used to be "First St." is gone at that end of the island and "Second St." is now the oceanfront road. 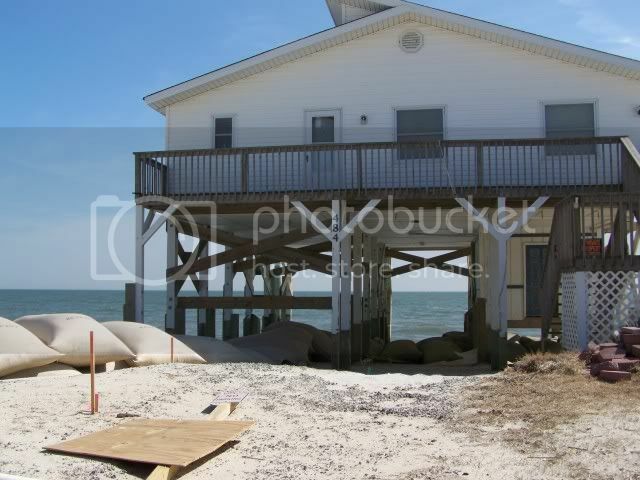 However, I agree about overbuilding on these barrier islands can come to no good, especially on the beach side. Trying to put any kind of berms or offshore barriers has ecological repercussions much beyond the short-term salvage of the beach. It's sad to see houses being swallowed by the ocean, especially when they didn't even used to be oceanfront, but nature always wins. Development on NC's beaches has gotten WAYYYYY out of control in the past 20 years or so, as anyone who's been around that long remembers.